Helen Nakano, at top, enjoys a game with the ladies and cherishes her grandchildren, Arielle, 15, and Matthew, 10 months. 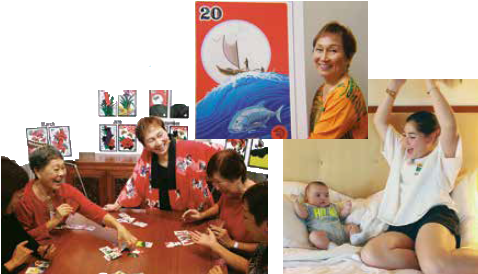 I started Hanafuda Po¯‘ai (friendship circles), where players of all ages can come together to play, socialize. We now have two groups, Na Ku¯puna Makamae at the historic pumping station in Kakaako, and at Lanakila Multi-Purpose Senior Center. We want to grow our po¯‘ai. A lot of seniors live by themselves. When you see a young kid playing with an old person, it’s very magical and wonderful! My granddaughter, Arielle Spivack, is 15, but she was just 5 when I taught her to play hanafuda on one of our trips to her home in California. I advised Arielle to play hanafuda with boys she was interested in dating later. I told her, “You can find out if they are poor losers, impatient with slower players, or gracious winners.” These are character traits that carry over into their daily interactions with people, young and old. My grandson, Matthew Nakano, is just a baby and is great fun. I can’t wait to teach him how to play hanafuda! He giggles a lot and loves people. It will be great fun to see if all his “Hanafuda Aunties” and I can develop the winning skills of Hawaii’s youngest hanafuda player!